Hopefully the other pictures will show soon. For now I have to push forward because the news is pilling up. 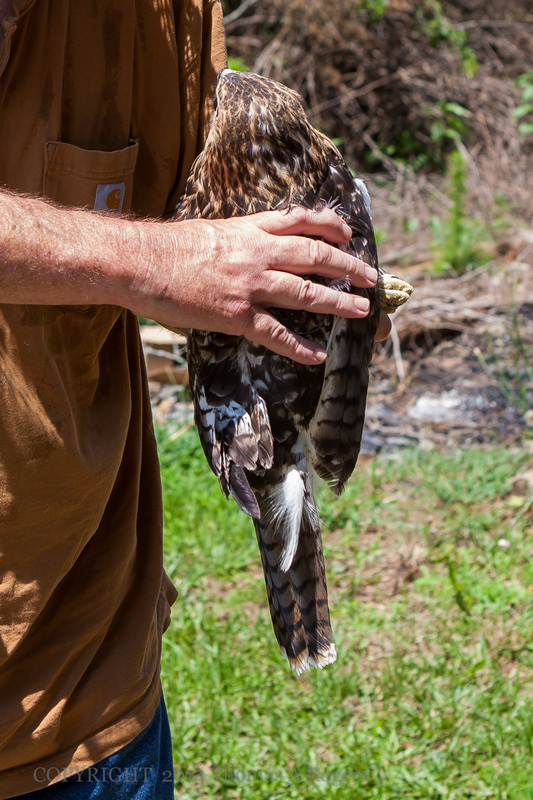 It was mentioned on the Bubba and Friends, Inc facebook page that we receive a cooper's hawk that died in our hands. A few minutes after he died rigor mortis set in quickly. While continuing to exam him for injuries I noticed blood coming out of the mouth. I collected some in a teaspoon, because the spoon was handy, with the intent of making a smear for microscopy. The blood never clotted, even in the very warm temperatures. Warfarin aka rat poison is an anti clotting agent. This substance kills by causing the mouse/rat to bleed to death, the death is not instantaneous. While rodent is thrashing about dying a hunger raptor , or your dog or cat, comes by and ingests part or all of the rodent. Warfarin doesn't break down but is transmitted through the carcass into the next animal beginning the process again. I am 90% sure this death was due to warfarin. Please be careful if you must use this product and do no sprinkle it around the base of bird feeder poles to stop the squirrels. Have heard from a couple sources that this sprinkling is a recommended solution to squirrels and feeder problems. It's not a solution. 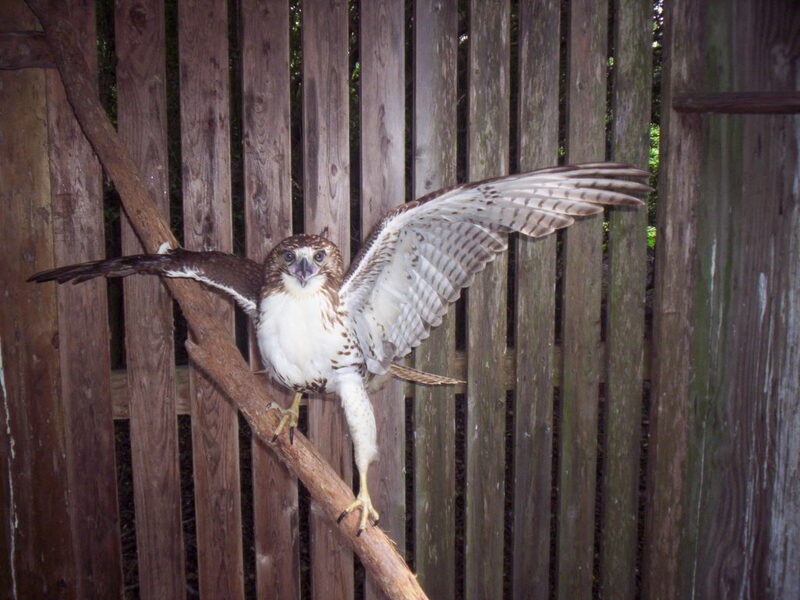 This is the backside of a beautiful juvenile male red tail hawk. 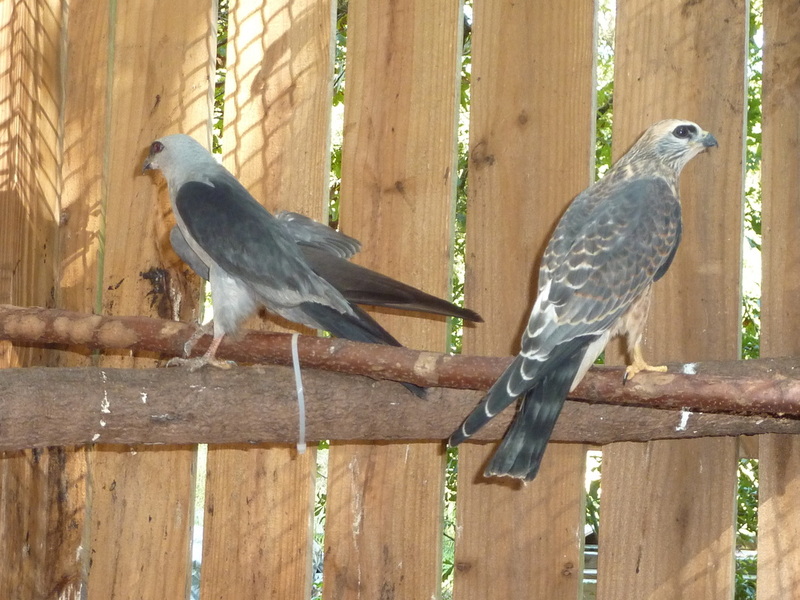 Notice the tail is not red, the tail becomes red after first moult. 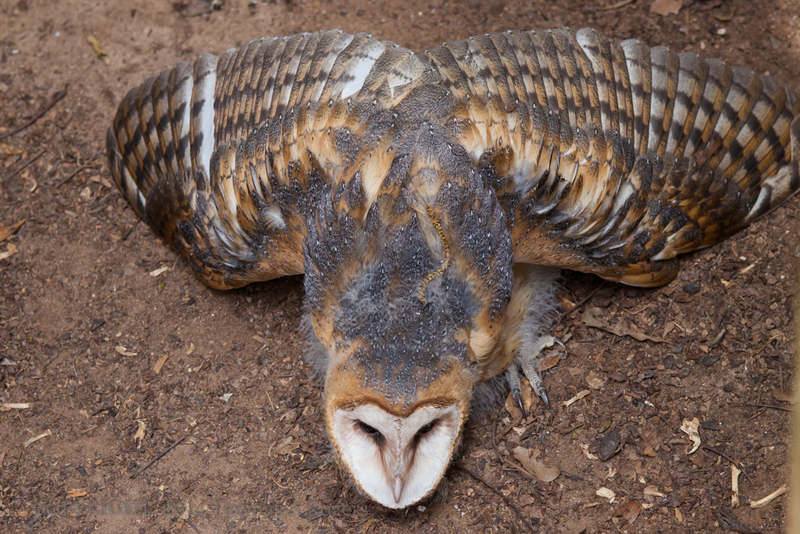 This fellow has a "fractured wrist", the bones are out of alignment. With a wrap and a good food he should be releaseable in a couple of weeks. 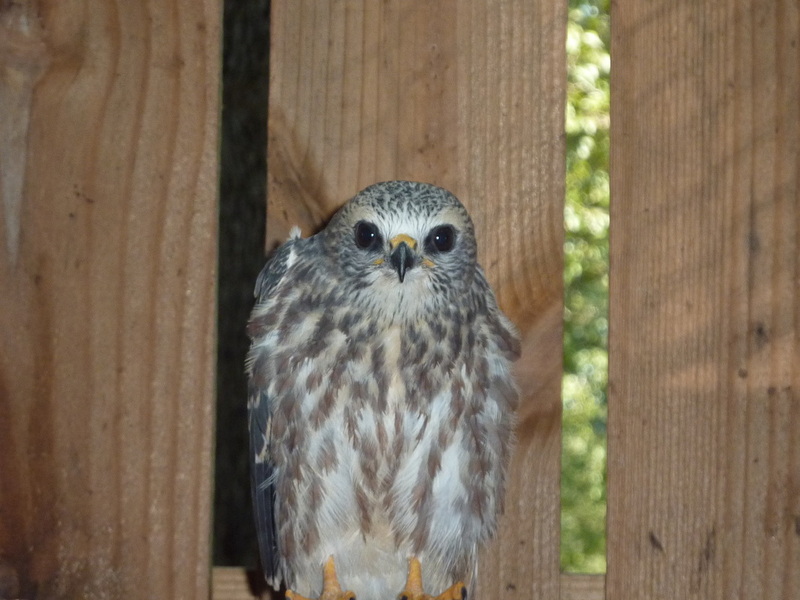 This is one of two Juvenile red shoulder hawks that we have received in intake. 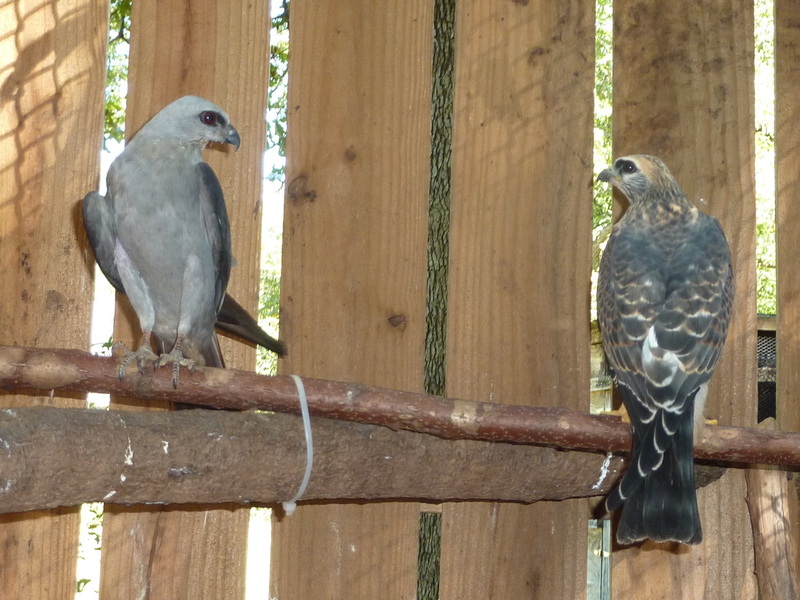 There are two in the flight pen but one refuses to sit on a perch while pictures are being taken. 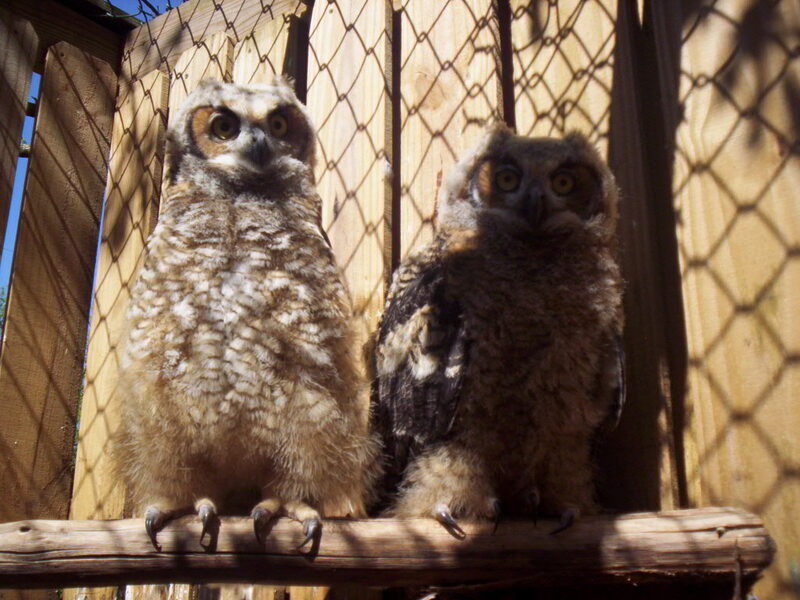 Both are this years hatch and have finally lost the last of the down, adult feathers are taking over. 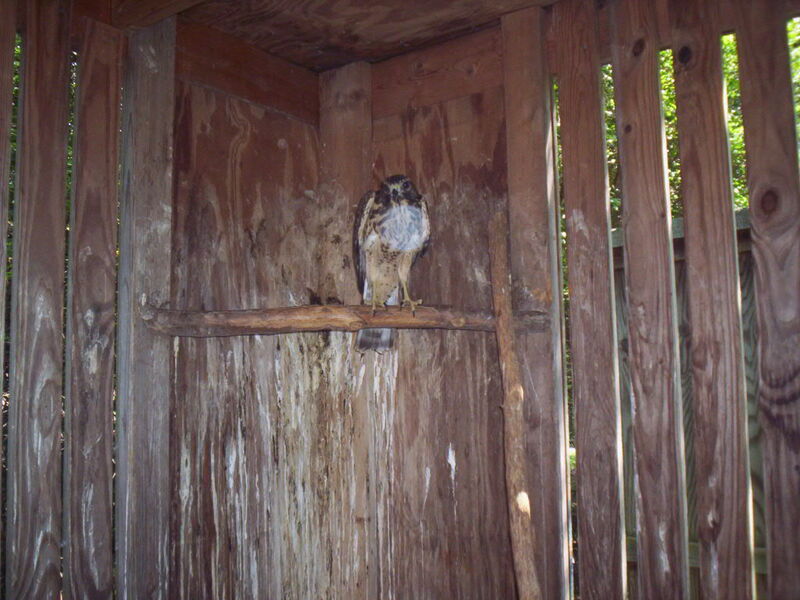 This is "Grunt", a 1st year Red Tail found "hiking" on Interstate 75 south below Macon. 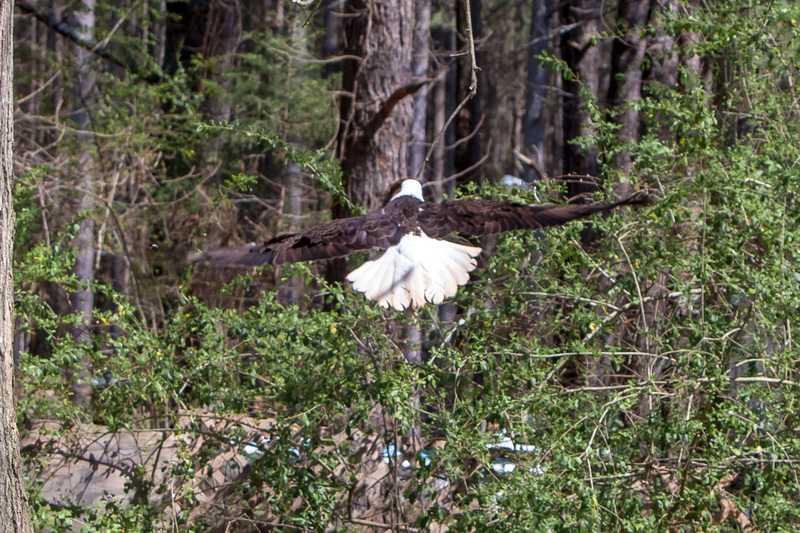 He had a fractured which is healed and he is in flight conditioning. He has very gorgeous coloration in the sunlight. 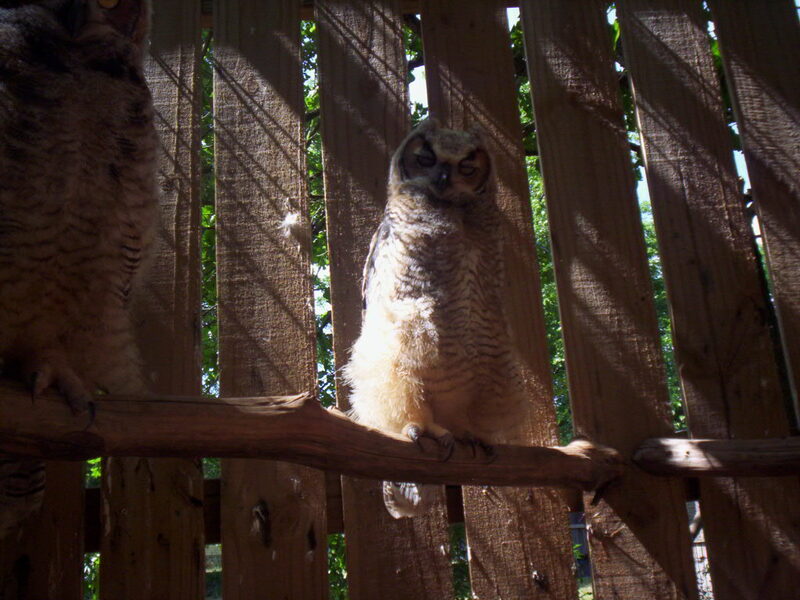 The juvy Great Horned Owls are continuing to grow. Notice the one on the left finally has "horns". 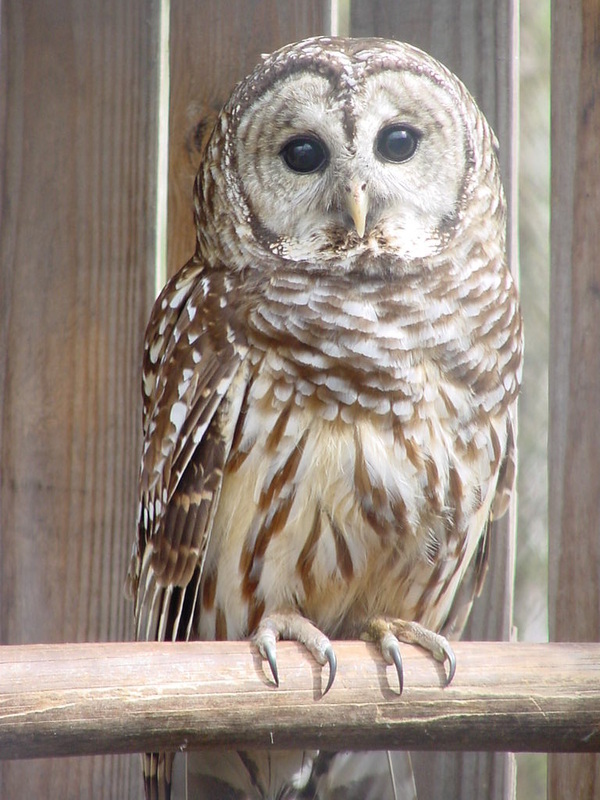 Horns are just tufts of feathers on top of the head, they aren't sharp nor do they contribute to hearing. 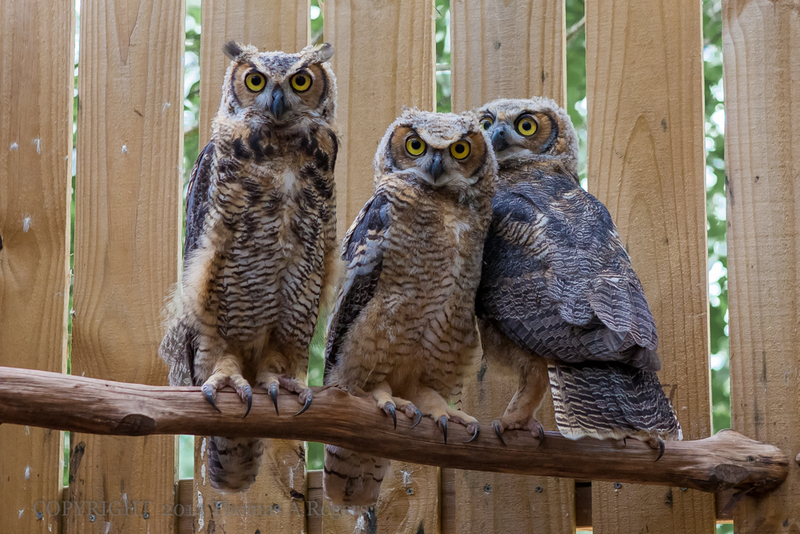 In Victorian times a group of owls was called a "parliament", a title given in honor of their alleged wisdom. I think it's perfect name because like a Parliament these guys get very little done too! 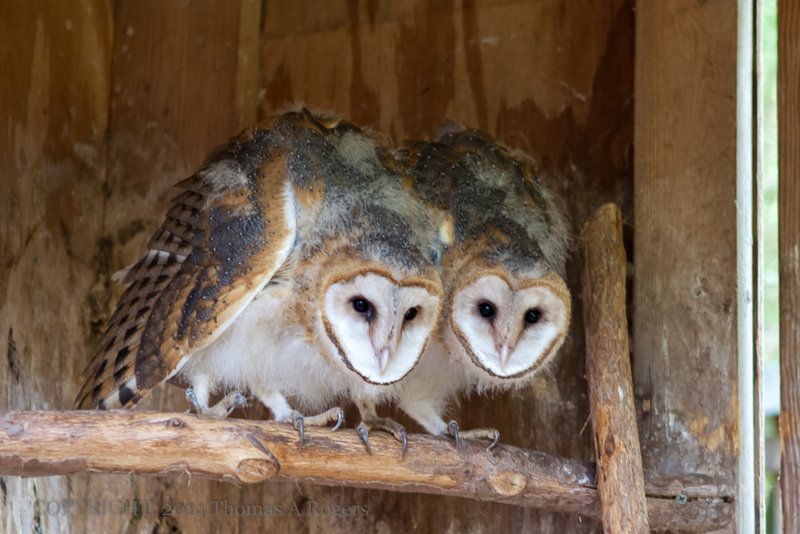 We got in 3 barn owls from Laurens Wildlife.1 has self released but is still coming in for food every evening. 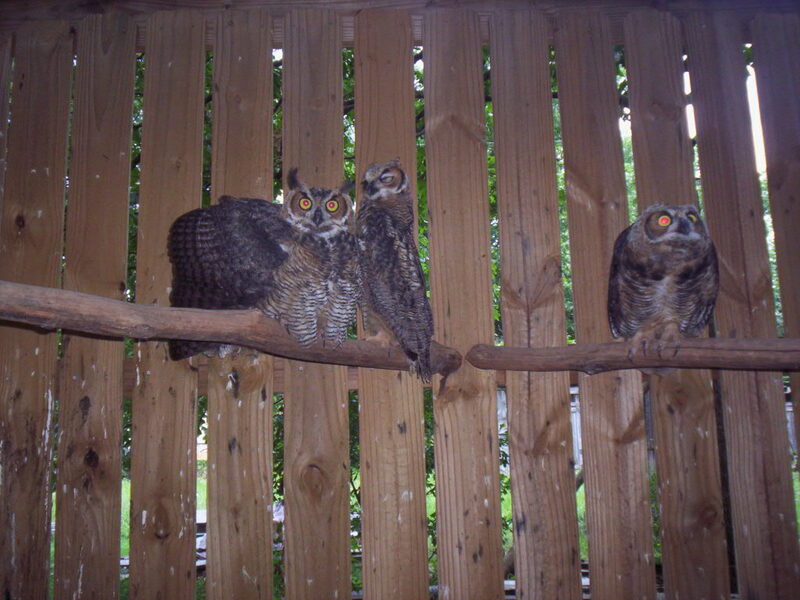 These 3 are a sibling group ( Jim that means they are kin!) 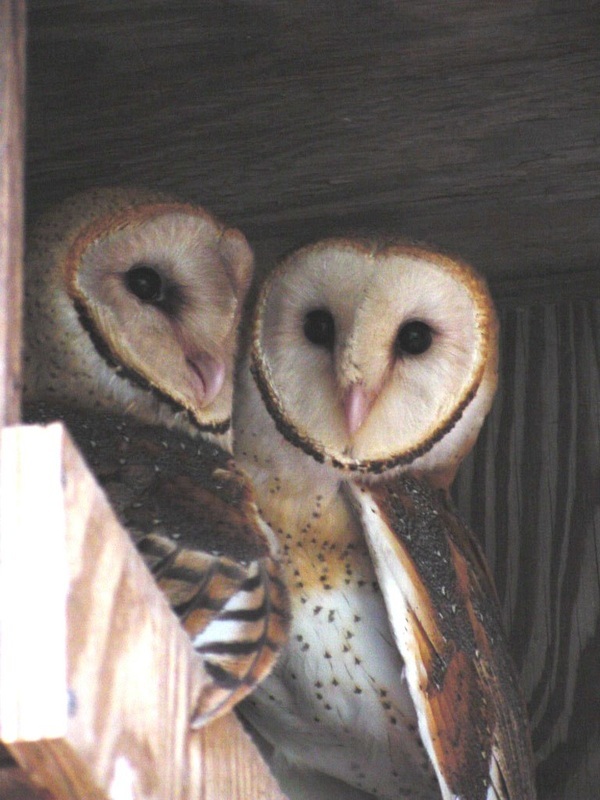 and stay together , the one who is half in rehab comes in to get his food when these 2 get fed. 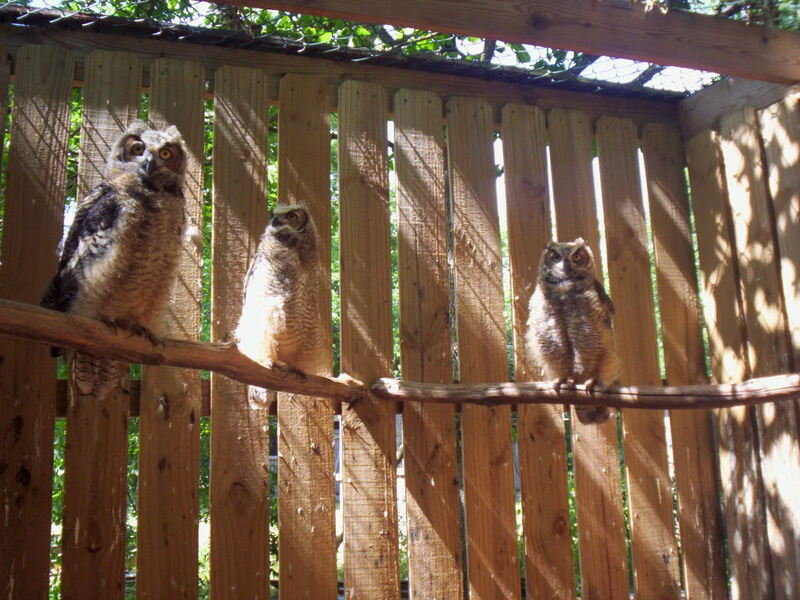 Hopefully all 4 will be able to get along in the wild. Possible release sites are already being evaluated as their graduation day is approaching. 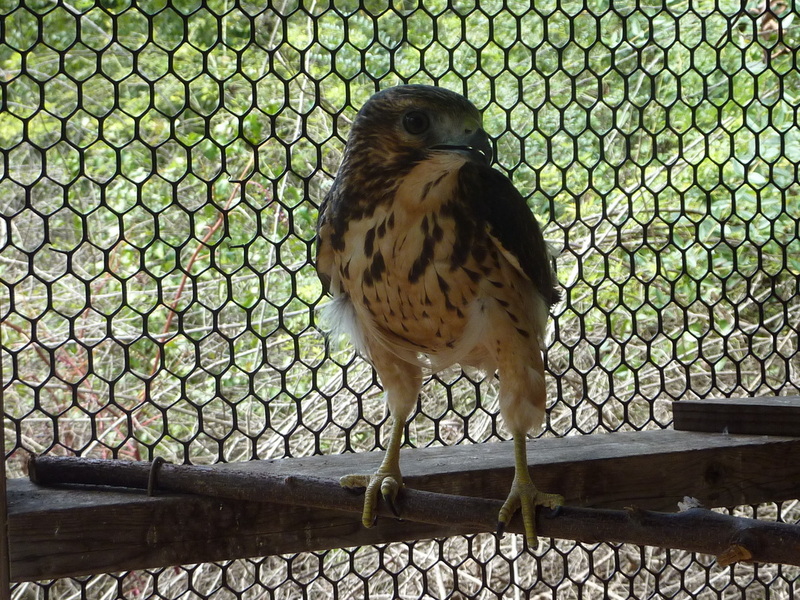 We have, locally, a place where we have permission to do Raptor programs. Details are being worked out and a dry run is in progress. I am excited about this as we can do 3-4 programs a year and can do special programs for our supporters. More details to come. We are suppose to be in Georgia Trends magazine in July. Candace Dyer wrote an article and borrowed some pictures. Can you imagine us in a real magazine? Note- At the top of this page their is place for comments. Click on it and leave a comment. I can answer your questions right here... on this very website. Ain't it a wonderment? Think I have be hanging around Parliament to long. 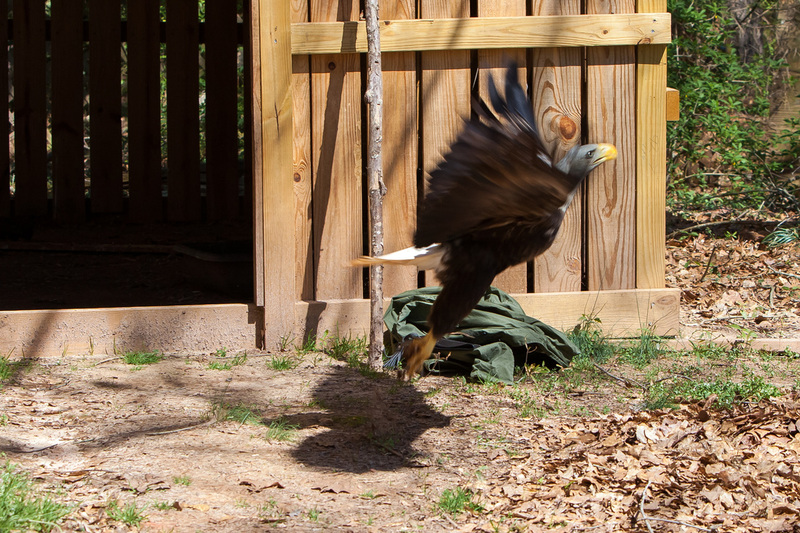 It's fuzzy buzzard time and no jeopardy contestants here ! Warning ! The last picture on this page is very graphic. 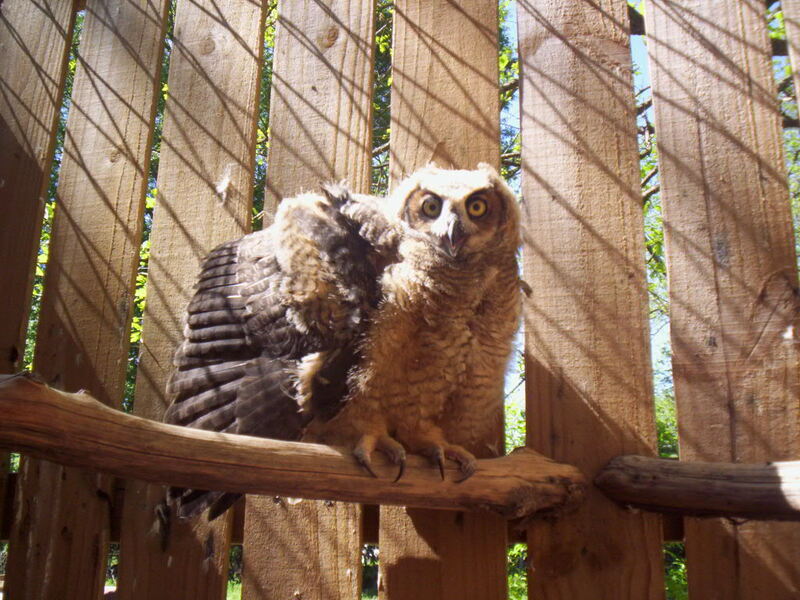 It's late in orphan and many babies have started to fledge. 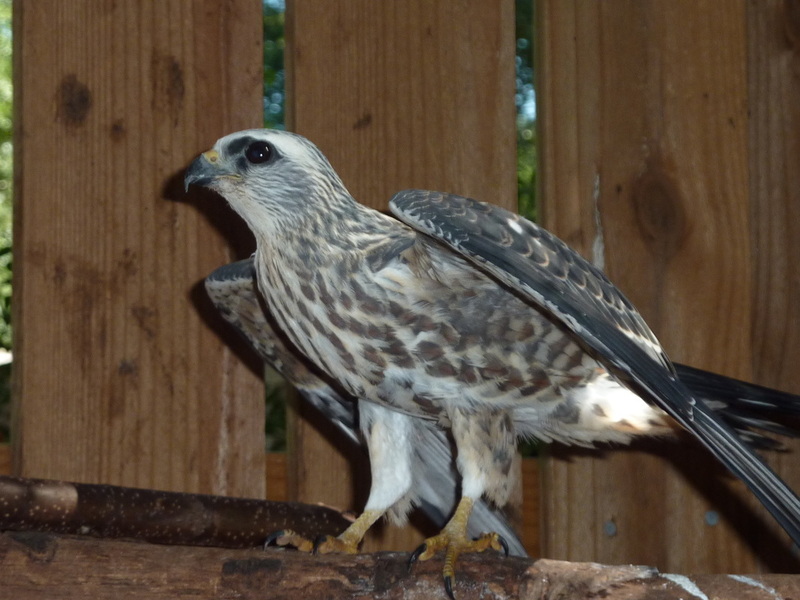 I was rather surprised when Jim Heard called me with a rescued baby black vulture and a juvenile red shoulder hawk. He rescued them from people who almost made "pets" of them. 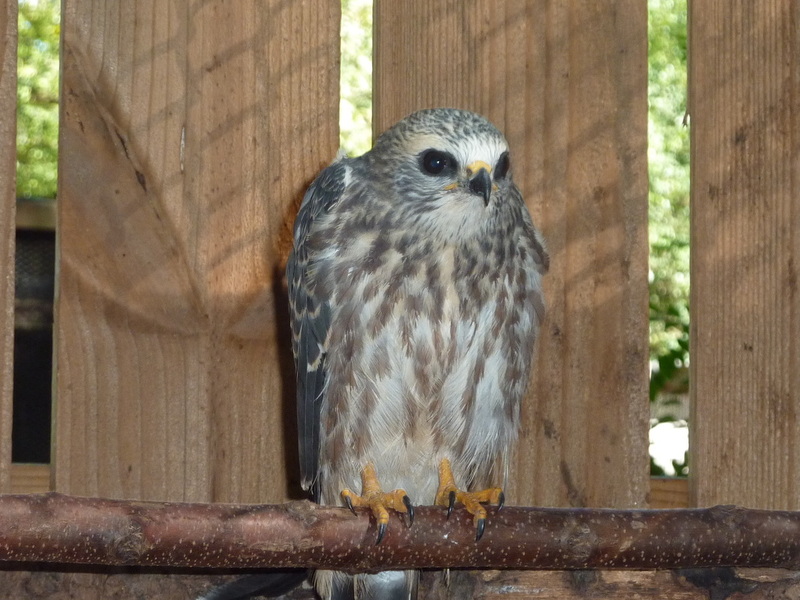 He is a very healthy juvenile, think it's a he, and has enough of a wild edge that he should be an easy release. 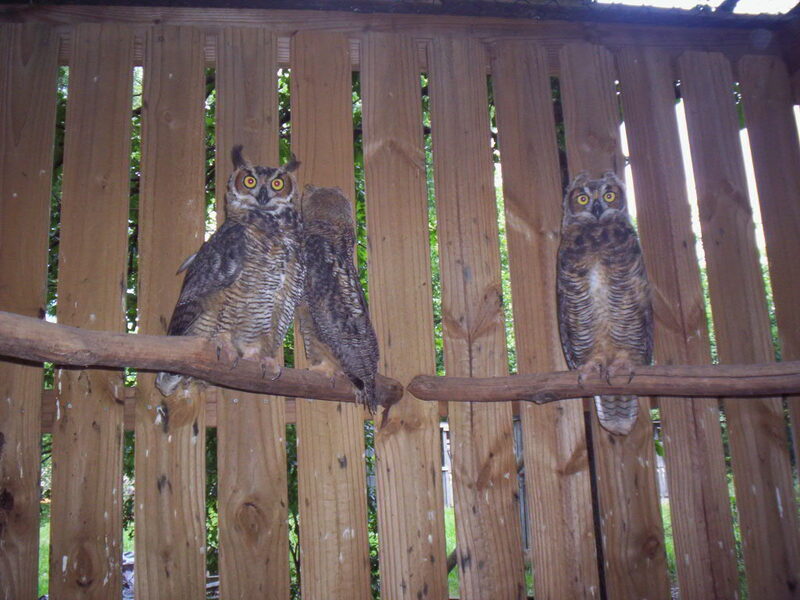 Here some updated pictures of the juvy Great Horned Owls, their horns are still fuzzy bumps on their heads. These 3 thought they wanted to be Jeopardy Contestants. I gave the 3 of them all day to spell "IQ". They finally decided to just make faces at the camera. Guess you notice there only 3 of the 4 pictured. 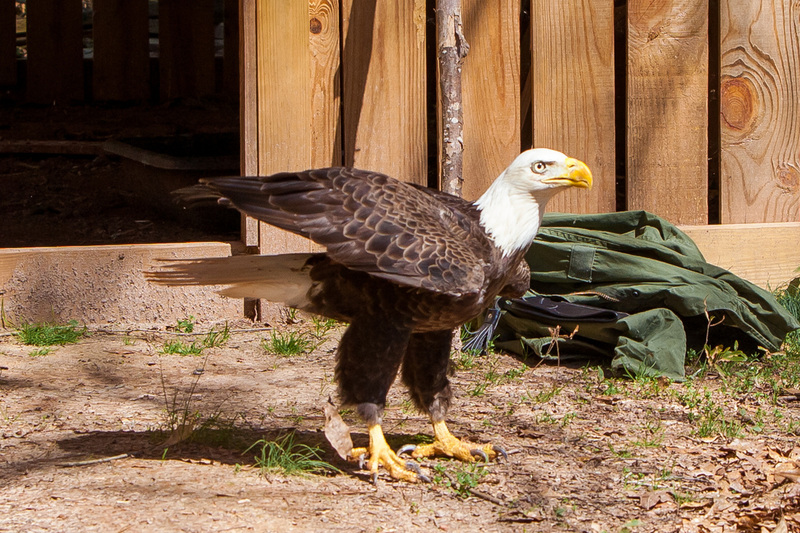 The fourth is in a fight for his leg and his life. He has been bitten by a recluse spider, our best guess, and has some serious issues. 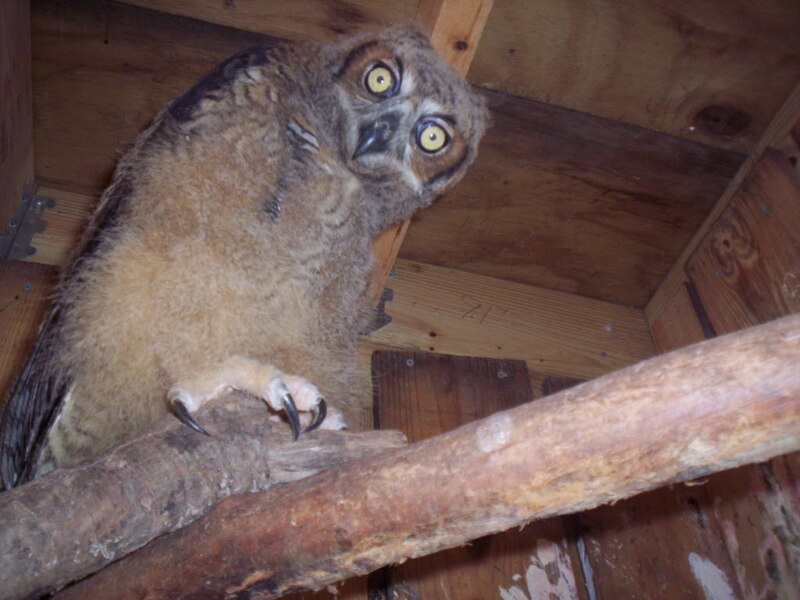 The following picture is of his 2 days after the bite. You can see the bite site on the side of his foot. The foot is currently coated with a special formula and wrapped to maintain moisture. Am hopeful about his prognosis but it is going to be a long haul. 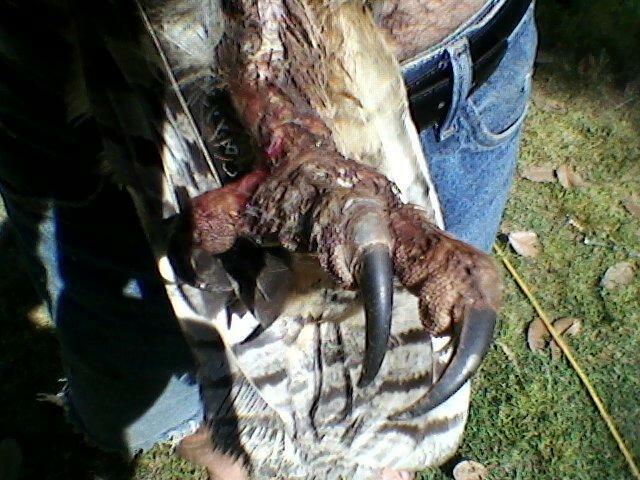 This is the first time in 25 years I have seen envenomation in a rehabbing raptor. Real Stuff and Class of 2014 in one place. After much patience and effort I finally convinced these guys that the camera, the shiny thing that is looking at you, was not going to "steal their souls" got some photos. Here they are. The top picture is a large female. 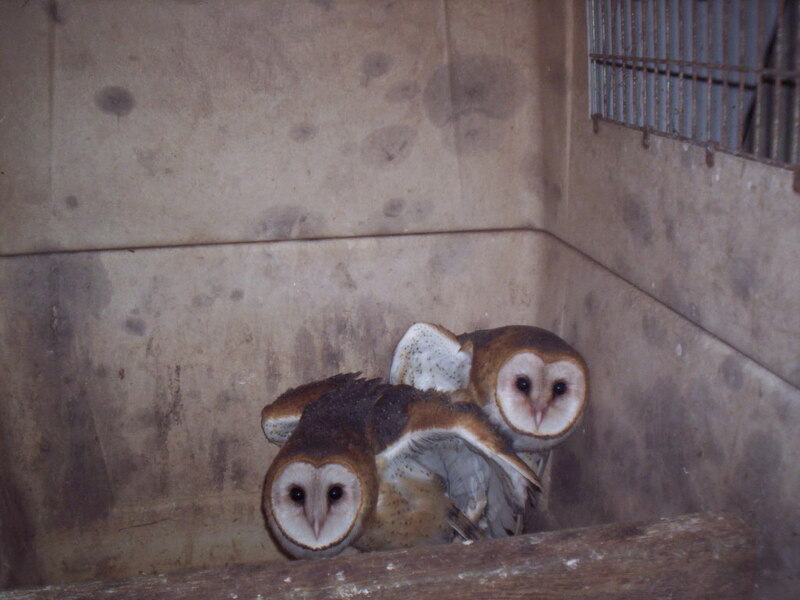 The middle appears to be a female and a male. 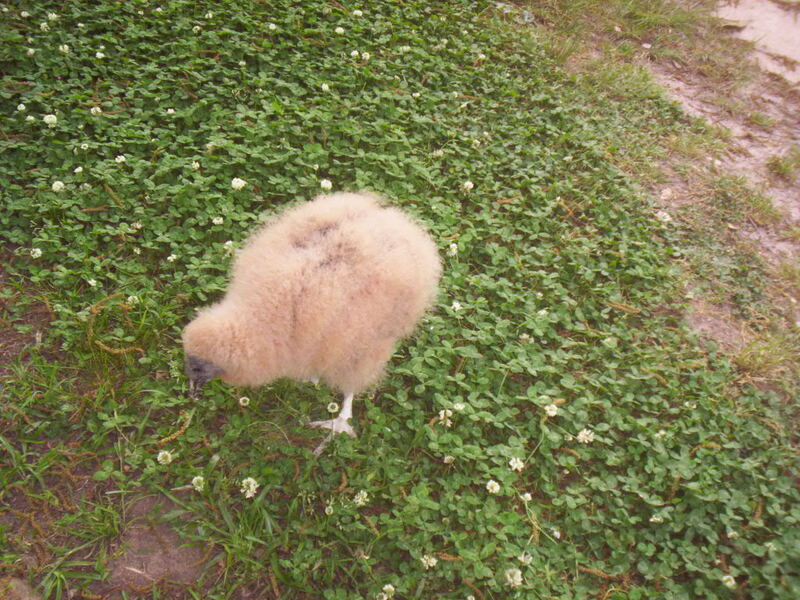 The third one is a little runt male with an eagle attitude. 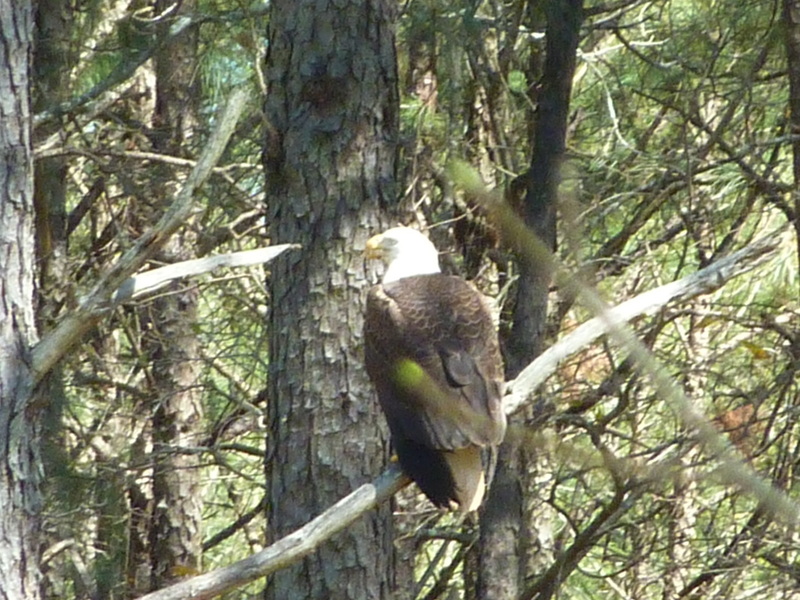 Have been trying to catch them together on a perch but they scatter when the evil shiny thing points it's "eye" at them. 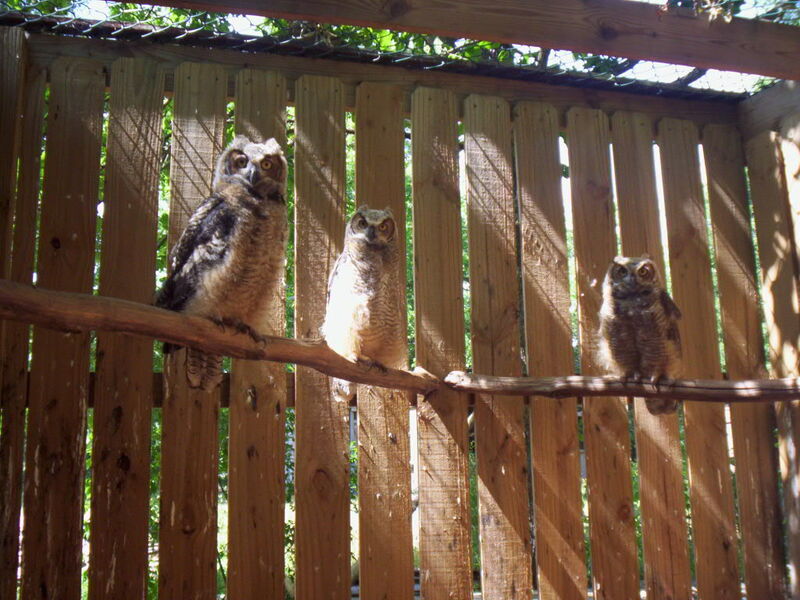 There is quite an age spread on these 4 owls. 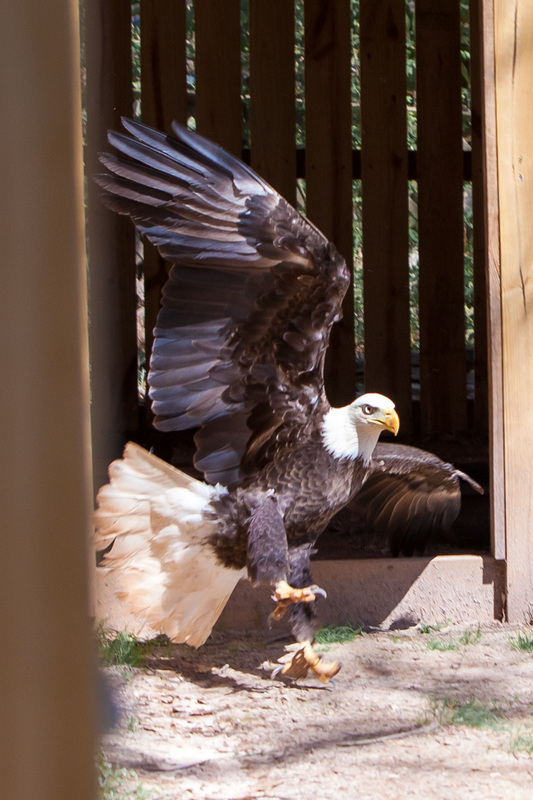 Notice some have more feathers and less fuzz while others have more fuzz and less feathers. They consume 4-5 25-35gram each daily. That's about 20 mice per day, about 3 (150 mice)bags in 7 days and we are looking at a couple months before any release is possible. Will detail more as soon as possible. As of now they are very tolerant of each other and are eating well.